It's official, an adult cannot review a pre-schooler and younger DVD and this is where family comes into the picture. 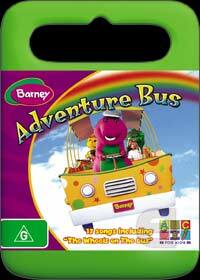 Add in a 4 year-old and someone with a university degree and here comes the Barney Adventure Bus review. My nephew danced, sung and ran around the lounge room as he watched this DVD. I was bemused and both amazed at how one DVD could hold his attention so long. Once it finished, he asked me... can we watch it again? Sure I said as I pushed play on the DVD again and once again he was mesmerized. This allowed me to write this review on my laptop and keep some sanity about the hole situation as Barney and friends ride a bus to a variety of strange and imaginary destinations like Barney's Purple Pepperoni Pizzeria. It's pretty hard to find a kid's DVD that children won't enjoy but it's rare to find one that is so enjoyable and I believe that Barney Adventure Bus is one of those DVD's that can be watched over and over again. Sadly, I cannot get some of the tunes out of my mind and I may need counselling. With great video and sound quality, the creators have truly created an imaginary universe that children will simply adore and this is one DVD that we could happily recommend to parents.